Thanks a lot for your support last year. We took some time off to plan for 2017 and we are happy to let you know that The Fireplace: Tot Tales is back! 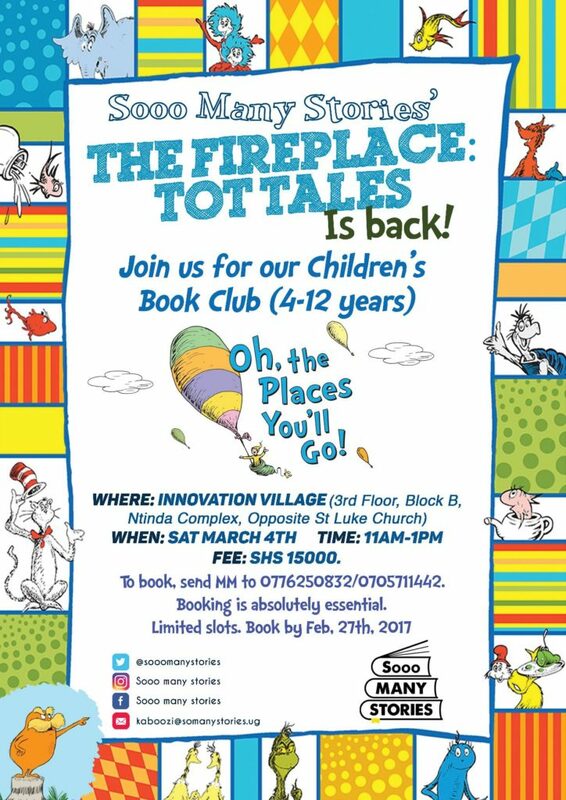 The Fireplace: Tot Tales is our book club for children from the ages of 4 to 12. The book clubs are split into groups of 4 to 6, 7 to 9 and 10 to 12 year olds. We are thrilled to let you know that we have found two new beautiful, child-friendly venues. For our parents in Ntinda, we will be meeting at The Innovation Village. The Innovation Village is on Ntinda Complex opposite St. Luke church block b 3rd floor. We’ll meet on 4thMarch. For parents in Bugolobi, we will meet at Dancing Cup, Luthuli Avenue on 11thMarch. Entry fee remains UGX 15,000 per child; this also covers a snack. Early booking is essential because we are only taking 15 tots per group (4 to 6, 7 to 9, 10 to 12). Early booking also enables us to plan adequately. For Ntinda, booking should be done by 27th February. For Bugolobi, please book by 6th March. To book, please send money via mobile money to 0776250832 or 0705711442. You can pay half-year subscription (4 months) at UGX 55,000 per child or full-year subscription (8 months) at UGX 115,000 per child. We have missed our tots immesnsely and we can not wait to see you all again!